Let Us Waterproof Your Home Today! Strengthen & Stabilize with Piering! 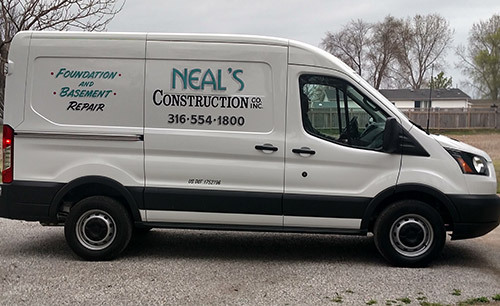 Since 1984, Neal’s Basement Waterproofing and Foundation Repair has been the go-to foundation repair contractor for Wichita, KS home and business owners. Our experts specialize in foundation repairs of all types, including grading, concrete leveling, waterproofing and drain tile installation, as well as piering and underpinning. Contact us today for more information. The foundation of your home or business is integral to the integrity of the structure. If you’re noticing doors or windows sticking, step cracks between bricks or have visible moisture in the basement, contact Neal’s Basement Waterproofing and Foundation Repair right away. We take all of the necessary steps to assess any issues with your foundation and provide tailored foundation repair in Wichita, KS to resolve them for good. Our solutions are long-term and address the core of any foundation troubles, assuring you peace of mind for years to come after they’re implemented. Among our capabilities we offer bracing, piering and underpinning, leveling, grading, drain tile installation and more. We’re also your premier experts for basement waterproofing in Wichita, KS. Water in your basement can cause problems that range from irritating to costly and damaging. We take the time to discern where the water is coming from, so we can administer waterproofing solutions that are effective and lasting. We’ll help you protect your basement from intrusive moisture, so you can reclaim this usable space in your home. Whether you’re dealing with water or cracks, Neal’s Basement Waterproofing and Foundation Repair is here to help you correct and preserve the integrity of your foundation. Get in touch with us today to learn more about our tailored approach to delivering service. Our business is recognized with a superior rating by the Better Business Bureau (BBB). We’re a locally-owned and –operated business in Wichita, KS. Our services are available to residential and commercial clients alike. We’ve been in business since 1984 and are backed by decades of experience. We’re happy to provide you with a free estimate on any recommended services. For foundation work that you can count on—including waterproofing, piering and underpinning, and drain tile repair—contact our experts today. We’ll gladly provide you with a free estimate. March 1, 2017 Mary H.
"I appreciate the professionalism of the owner and the crew." February 17, 2017 Daryl W.
"Thank you for having our basement wall repaired so quickly. Your workers did an excellent job!" December 12, 2016 Ronda R.
"My basement has been dry for the first time in a very long time, it is a huge relief! Thank you so much for your advice and your team's good..."